» Why are Yeti Coolers so Expensive? Yeti coolers are one of the most well-known brands of outdoor coolers. The brand founded in 2006 claims that its goal is to: “build the cooler you’d use every day if it existed”. Since its foundation, the popularity of Yeti coolers has grown significantly, and now one of the most popular outdoor and camping trip cooler companies in the market today. 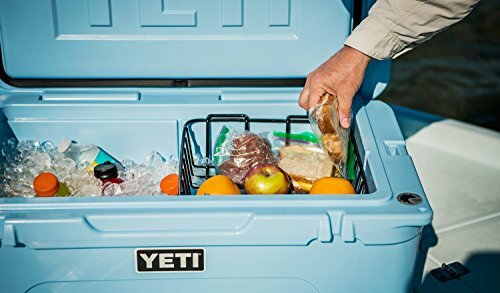 In order to examine if the Yeti cooler works for the cost for your camping trip, let’s look at these problem areas in depth. Since the hard shell yeti alternative coolers have the most variety lets look at those first. 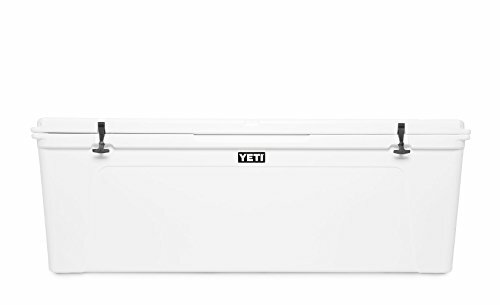 Yeti coolers are made of heavy-duty rubber latches, which they call T-Rex Lid latches. These latches fit into an integrated latch keeper in a ball-and-socket-type closure, making the closures secure and strong. There are two rope handles along each side. This allows an easy two person carry and are long enough to keep your knuckles from scraping on the sides. The hard case coolers are constructed using a rotomolded process. This rotomolded process is the same process used to create whitewater kayaks, which allows for a one piece design that is very strong. The process creates strong consistent walls and corners, and eliminates the failure point of a two piece design so it will maintain your beverages and food cool for a lot longer period of time. The lid is also exceptionally strong. There are documented examples of people standing on the lid of these coolers. An example of this can be seen from this you tube video of a 500 lb man trying to destroy a Yeti cooler. These coolers are even able to withstand a bear attack! The lid has a full-frame sealing gasket, like a refrigerator. This keeps out circulating air, enhancing ice retention to keep the cool air. 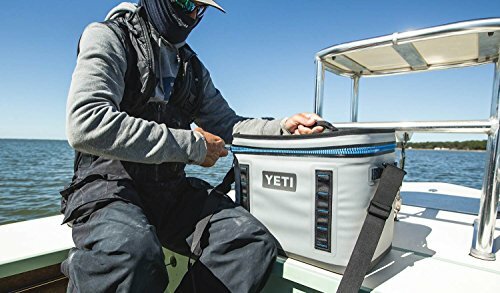 The Yeti cooler is also tested and safe for dry-ice use in the hardtop designs. The plastic is also injected with commercial grade polyurethane to keep it cooler to preserve your food and berevages. Reviews suggest that, depending on some ice retention factors (such as ice quality/ quantity, crushed/block/dry ice consistency, outside environment, and/or exposure to sunlight), items inside the cooler may keep cool temperature anywhere from 5-10 days. There are some other nice features that aid in making a Yeti cooler considered of a higher standard. Feet: Tundra’s standard equipment includes non-slip rubber feet that won’t scratch. These non-slip feet are able to be replaced with hard ones if desired to allow the cooler to slide. Drain port: The drain port is angled along the bottom and a detachable hose fitting is available to allow the cooler to drain more efficiently. Tie-down slot/lock pin slot: There is an integrated sleeve in the top to allow the cooler to be tied down and secured. A location for a lock or lock pin is integrated for greater security. Standard Warranty: Any purchase of a Yeti coolers also includes a standard 5-year limited warranty, covering any potential defects. The warranty does not cover defects caused by third-party modifications, repairs, or replacement parts. However, it does cover most wear and tear as well as defects that are seen on the coolers. SEADECK: This is a durable, slip-resistant foam pad make to adhere to the top of the Yeti cooler. It is made of 6-millimeter foam and is made to use as a standing or casting platform. Dividers: Horizontal or vertical dividers are available for added organization. These dividers fit in a molded in groove making them extremely strong. Yeti also claims that they can be used as cutting boards. TUNDRA BASKETS: Cooler Baskets are made with coated steel wire, and can be used to separate food above the wet line. All Tundra models except Tundra Haul™ come standard with one basket. BEVERAGE HOLDER : A heavy-duty powder coated stainless steel holder is also able to be attached to the coolers tie down slots. This placement holds your drinks without blocking entry into the cooler itself. ROD HOLSTER : A heavy-duty polypropylene tube can be attached by bracket to provide a for casting and spinning fishing rods. TUNDRA/TANK HANDLES : A set of marine grade polyester rope with a textured grip handles are available to be purchased for the Yeti coolers. These can be attached to the sides of the cooler to allow an additional carrying point. There are also attachment points on the sides of the coolers to keep these rope handles tucked into place when not in use. SECURITY CABLE LOCK & BRACKET : A cable lock and bracket are available for securing the cooler onto something secures. These are made of carbon steel and are very strong. You can use a cable or chain of your choice with this system. The Yeti soft shell coolers are made with what is branded a DRYHIDE™ SHELL . 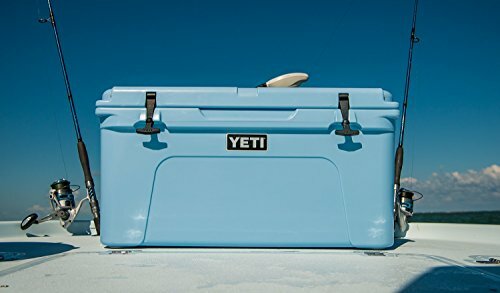 Yeti claims that the materials that are used to make the coolers are also found in HazMat suits and whitewater rafts; and that the fabric is high-density and waterproof. The coolers are also resistant to mildew, punctures and UV rays. Finally, an approved food grade liner is inside. The Yeti soft shell coolers contains a COLDCELL™ INSULATION which makes them keep their temperature. This insulation is a closed-cell rubber foam, which is stated to be superior to other coolers. This is supported by Amazon reviews of the product. One review makes a bold statement saying: “Keep everything cool in 115° weather, all day long. Highly recommended!” Another review stated: “Ice barely melts even over 24 hours”. 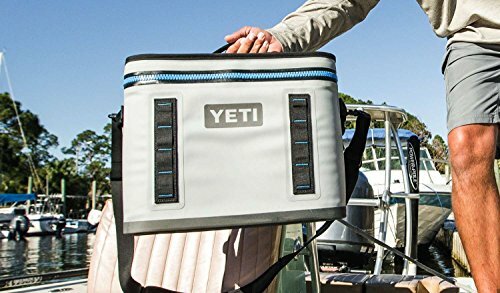 A HYDROLOK™ ZIPPER is placed on all Yeti soft shell coolers. These zippers are not only tough and high performing, but they are also leak proof. Some customers state that these zippers can be hard to close until they are worn in due to their toughness. The opening into the coolers are designed wide in order to have increased access and visibility to the interior. Added to the exterior of the coolers are a HITCHPOINT™ GRID system. This looped system allows the user to attach items with carabiners or ties to the loops for ease of carrying accessories. The Hopper BackFlip™ 24 model is also able to be carried as a backpack. As a backpack it features ergonomic shoulder straps, and removable chest and waist belts to increase stability. The Hopper Two models also have Six D-ring tie-down points allowing you to secure the cooler. There are also detachable shoulder straps and three different sets of handles to allow different carrying options. SIDEKICK DRY : The SideKick Dry™ is a waterproof gear case that attaches to the hitch point grid system of the soft coolers. This addition gives the consumer a safe way to carry additional items without the fear of wetness. MOLLE BOTTLE OPENER : This opener attaches directly to the soft cooler’s hitch point grid. It is low profile to prevent snagging and is made of a corrosion-resistant stainless steel. MOLLE ZINGER : The zinger is a retractable cord which attaches to the hitch point grid. The cord is made of braided bomber cord and is very strong and durable. The zinger also rotates to allow for maximum reach and efficiency. YETI PATCHES: There are 6 available patches that can be used to decorate the exterior of the Yeti soft cooler. Patch measures 2”x3” and is compatible with any hook-and-loop surface. So, the real question is not why the coolers are expensive, but rather if you need one. Overall, I feel that the Yeti coolers are worth the price tag. Reviews are positive and the features supported by the company website are strong. The Yeti brand coolers are expensive because of the features and technology used to construct the product. As a consumer, I appreciate a product that performs as advertised. The hard shell coolers are the most well known however, I am excited about the soft shell coolers. 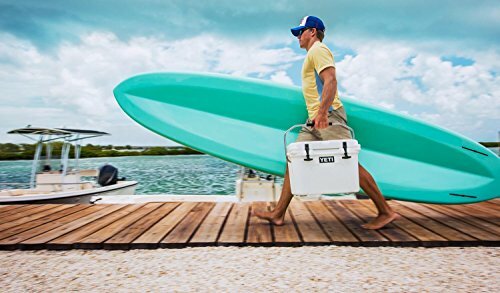 I also appreciate that the Yeti company has additional features that would be useful such as carrying options and accessories for their coolers. These features will make these cooler more useful to a variety of people, and make it feel like these coolers could be customized by the buyer to fit their specific need. The multiple handle options on the hard coolers, for example, give people who do not like to carry heavy loads with handles the option to carry with the rope attachment. I feel that if you need a cooler that is durable a rugged that a Yeti cooler would be worth the cost. 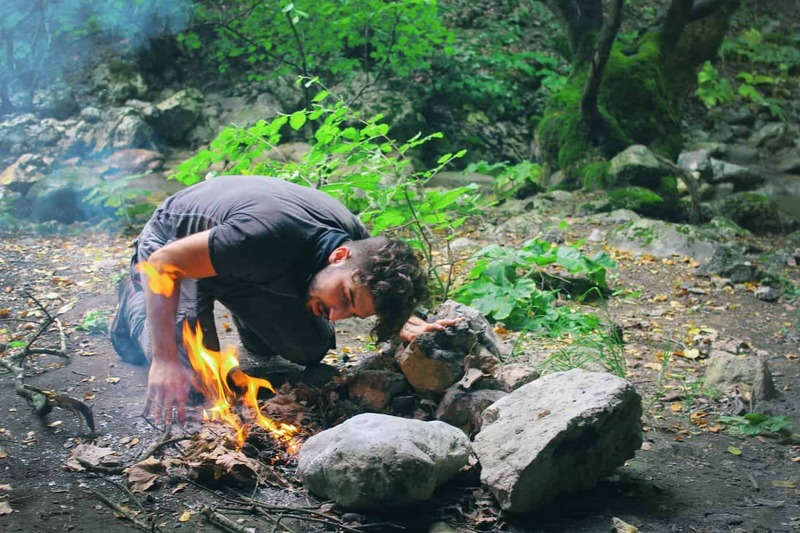 This would be especially true for camping, fishing, and other activities that require a long time warm environmental exposure. 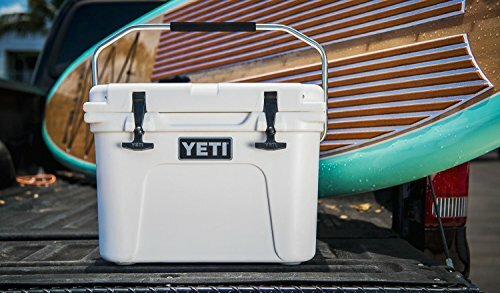 So, if you have the need for a high-quality cooler head over to the Yeti website for more details on sizes, designs, and price points for their products.